Last time in Otaku Ohana: This was happening. 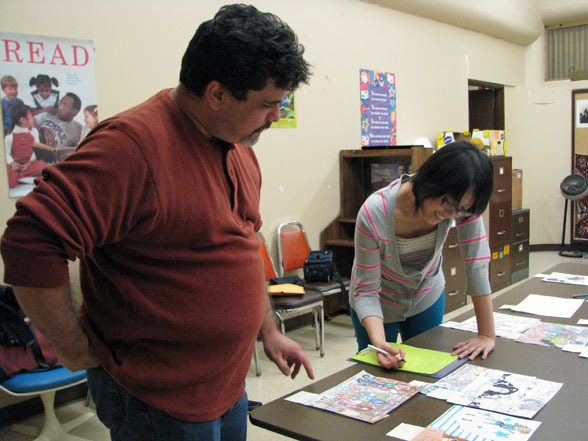 That’s Kawaii Kon senior administrator Roy Bann on the left, nemu*nemu artist Audra Furuichi on the right. Behind the camera taking this picture was your friendly neighborhood anime/manga blogger. 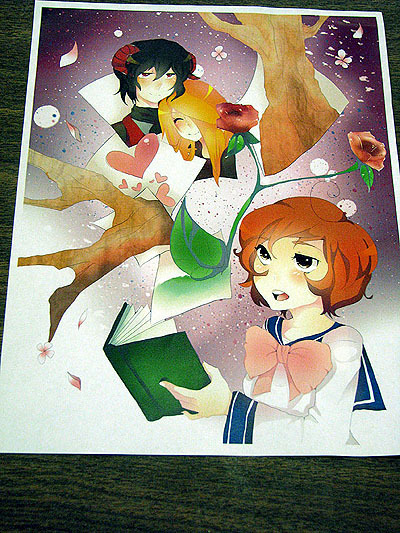 And the three of us were busy picking winners for the 2012 Liliha Library Anime Art Contest … which, as we established in the last post, would be the last one. A comment from Audra to someone last night on Facebook reminded me that I haven’t said in this space why the contest is going three-and-out. It’s a combination of factors, really — it takes a lot of work for Liliha young adult librarian Linda Mediati to coordinate and run the event, sponsors aren’t as generous as they used to be, and the number of entries declined between the second and third contests. Three cheers for Linda for putting this together these past few years, though, and here’s hoping that someone else picks up the ball and runs with it sometime down the line (hint, hint, people reading this blog who have the power to organize such things — there are a lot of eager young artists out there, and you know you already have three candidates as judges … *points at myself, Audra and Roy*). But let’s get back to the matter at hand, celebrating the talented students whom the three of us picked as this year’s winners. As I noted on one of the pictures in the contest gallery that went up yesterday, there was a theme that contestants were supposed to follow this year: “Books: Imagination at Work.” Some did. Many more did not. We ended up creating four divisions: “General, Grades 6-8”; “Comic Page”; “General, Grades 9-12”; and “Theme.” There were three winners in each category for a total of 12, plus one lucky 13th entrant, the grand prize winner, picked out of the “theme” pool. I’m not going to draw out the suspense any longer than I have to, so here it is: this year’s grand prize winner, by eighth grader Isabella Iwasaki. There were a lot of great entries, but this particular one stood out to the three of us for its simple elegance, how it embodied the theme just with two figures: the girl reading the book, and her imagined self as a glammed-up rock star. It’s a simpler composition than the grand prize winners that Audra and I have picked in the past, but certainly just as effective. A few other trivia notes before I launch into the standard Flickr photo gallery: Two people earned the distinction of winning honors in all three contests — Nicole Nguyen, who won the Grades 6-7 division in seventh grade for her piece “Bleach in Hawaii” and took first place in the “Best Color, Grades 6-8” division in eighth grade with “Miss Alice“; and Joelle Takayama, who earned an honorable mention as a sophomore with “On the Roof” and took first place in the “Best Color, Grades 9-12” division as a junior with “Magician.” Here’s Nicole’s piece from this year’s contest, which took third place in the “General, Grades 9-12” division. And here’s Joelle’s piece, which earned first place in the “Theme” division. Also triggering my “hey, this name looks familiar!” senses: Ming Qi Vinci, the girl who organized “Anime for Charity: A Mini-Convention” in Kaneohe back in October 2011. She’s actually entered several times as well, but this is the first time she’s actually won — second place in the “General, Grades 9-12” division, for this piece. Three familiar names out of 13 winners … that tells me there’s a lot of fresh talent out there. An encouraging sign, to be sure. And now, the gallery of winners’ artwork. Again, congratulations to all of the winners! A reminder: If you’d like to come meet these talented students — and the panel of judges, including myself — you can do so today (Saturday) at the library, 1515 Liliha St., at 10:30 a.m. If you can’t make it, though, sit tight — I’m bringing tag-team partner in fandom Wilma J. along for the ride, and we’ll be chronicling what happens at the winners’ ceremony in this blog soon.